I can’t wait to be in my running gear the next time I get my picture taken with Belle! Over the past couple months as I’ve started my journey in preparing to run my first half marathon, I’ve realized that setting short term goals for myself is giving me the extra push and motivation to work hard towards both my short term and long term goals. About a month and a half ago, I began leading my Thrive Across America team as a way to not only motivate myself at what is still the beginning of my running journey, but to also help motivate and inspire others to work towards their own fitness goals. Although my team is far from the top of the leader board, we have all still been successful in our progress towards individual fitness goals. With the challenge coming to an end in a couple of weeks, I’ve been searching for a new challenge for myself in order to help keep myself motivated in further my running abilities. Today I read about Under Armor’s “What’s Beautiful” Challenge on one of the blogs that I follow, Through Heather’s Looking Glass. Heather wrote about her “What’s Beautiful” goal of inspiring others, which inspired me to start this challenge for myself. The “What’s Beautiful” challenge strives to help women define themselves as athletes in an athletic world that is dominated by males. Each woman has the opportunity to set their own goal, and then document their journey. As somebody who is constantly focused on documenting vacations and other life events through photos, and now as a blogger documenting my running journey in writing, this challenge seems right up my alley. It is a fairly short term challenge, ending in July, so its naturally fitting that my “What’s Beautiful” goal be something that can be accomplished between now and this summer and not just be vague in progress towards preparing for the Disney World Half Marathon, which is still eight months away. So what is my “What’s Beautiful” goal? To run my first 10K. 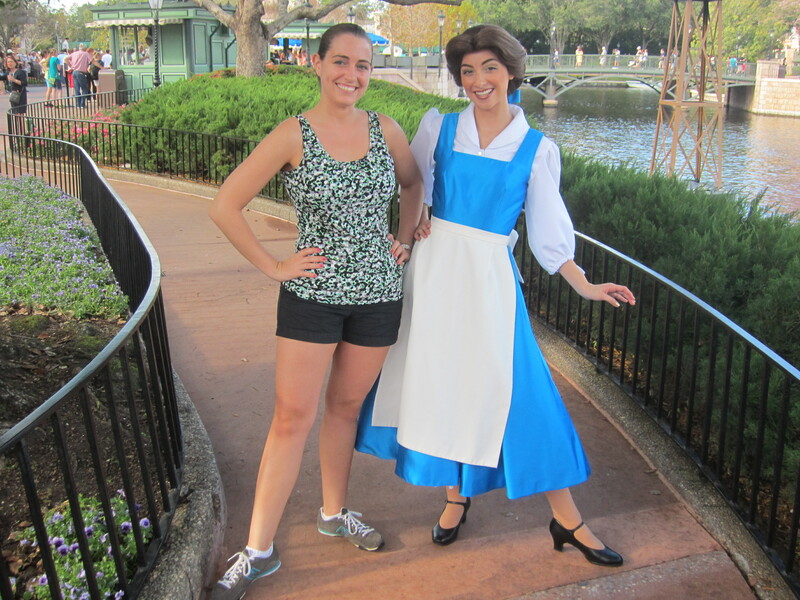 My dream is to get my picture taken with Belle, my favorite Disney princess, while wearing my running gear. I only started my “What’s Beautiful” page today, but I look forward to further documenting my journey in preparing for the Biggest Loser 10K in July. This entry was posted in Motivation, Races, Training, Why Run and tagged 10K, Biggest Loser 10K, Disney World Half Marathon, first half marathon, goal, half marathon, inspiration, motivation, Thrive Across America, training, What's Beautiful. Bookmark the permalink. Thanks, and best of look to you in reaching your running goals!